Summoned by Gul’dan from the depths of the Twisting Nether, Xhul’horac is one of the most powerful of the Void Revenants—a race of parasitic void-beings that tear holes through the planes of reality, consuming and absorbing the energies and beings within. Gul’dan has twisted Xhul’horac by feeding him overwhelming fel energy, and using his powers to tear open the portals through which he plans to rally the forces of the Burning Legion. /rw Ranged stack on Orange on Fel Phase and soft stack (5y) around Diamond on Void Phase. /rw One tank on Boss and one on Big add. Tank add on the side of boss and don’t stand ifront boss when tanking add. /rw If you are chained be sure you are spread from the other chained to remove it. /rw When Black Hole spawns at Void Phase all ranged stack next to it and enter it at the same time to share the dmg. /rw If the platform is getting overwhelmed with pools, use def CD and run to a void pool when having Fel debuff or Fel Pool when having Void debuff to clear space. /rw When boss switches Void and Fel all the time. One tank on Void and one tank on Fel. In this encounter, players will attack Xhul´horac and at the same time kill adds from the Burning Legion in which the boss summons from 2 portals. Portal 1 (left) will summon adds with Fel Energy power. Portal 2 (right) will summon adds with Void Energy power. The boss absorbes energy from these portals and dmg the players with it. After adds have been summoned from these 2 portals, the boss gains Fel and Void Energy from both portals which cause the portals to break. Xhul´horac becomes destabilized and more dangerous, and the players need to end it fast. Most important thing to know in this fight is that Fel Energy and Void Energy does not go hand in hand. It will cause an explosion. The fight is on a platform with no walls and if you fall, you will die. Phase 1 – Xhul´horac will from time to time focus on the summoning chamber which blows out Fel and Void energy on raid. This phase will occur on all phases. Phase 2 - Xhul´horac opens the Fel Portal. Meaning, Xhul´horac will have new Fel fire abilities and at the same time 2 types of Legion adds come out from the portal using Fel magic as well. Phase 3 - Xhul´horac opens the Void Portal. Meaning, Xhul´horac will have new Void abilities and at the same time 2 types of Legion adds come out from the portal using Void power. The Fel fire abilities from phase 2 are gone. Phase 4 Xhul´horac absorbs energy from both portals and unleashing both energies on players. Legion adds will come from both portals. Phase 5 - Xhul´horac absorbs all the energy from both portals causing them to break. 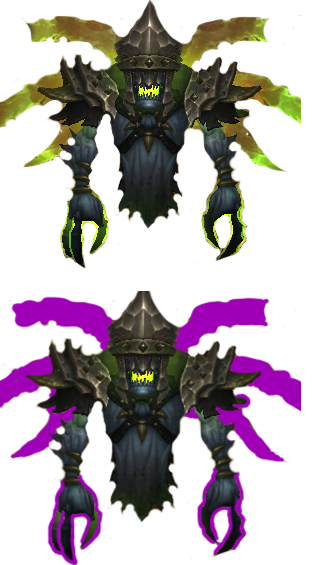 Xhul´horac will now have both void and Fel abilities and no more adds can come out. When Fel portal is up, stand on left side of the cirle (oragne marker). When Void portal is up, stand on right side of the cirle (diamond marker). Voidtouched debuff runs to right edge. Phase 5 Tanks Stand between portals. Melee face ranged. When pools are getting to big. Players that can use good defensive CD uses a Fel debuff on the shadow pool or a Shadow debuff on a fel pool. There is a summoning chamber in the middle betwen the portals. When Xhul´horac focuses on it, it smolder out of control releasing Fel and void energy on the raid. Players get this debuff if they take fire dmg from the chamber. Players get this debuff if they take shadow dmg from the chamber. A small pool of Fel energy. This small pool spreads over time. Player standing on it gets dmg every second for 8 seconds and it stacks. HOTFIX: Wild Pyromaniac's Fel Orb no longer creates patches of Chaotic Felblaze if it fails to impact a player on Normal and Raid Finder difficulty. A small pool of Void energy. This small pool spreads over time. Player standing on it gets dmg every second for 8 seconds and it stacks. This is an effect when Fel energy and Void energy touch each other. It can be caused in two ways. The reaction cause a great explosion and does high damage to players within 20 yards. Xhul´horac starts drawing Fel energy from the Fel portal and summoning legion adds from the fel portal. He gains two extra abilities called Fel Strike and Fel Surge. Tank use defensive CD, Heal use defensive CD/heal the tank up asap. Felblaze Flurry does medium/heavy fire damage on tank and increase fire damage taken by 50% for 12 sec and it stacks. Also, do not stand infron of boss if you are tanking the add. The debuff goes fast and the stacks go fast. Maximum stacks are 4 (200% dmg taken)which tanks can handle. This add has his health linked with boss. When he dies, next phase will start. Amount of players chained equals to amount of stacks. Each stack does low moderate damage. To break this chain, affected players need to spread out from each other. This add creates Fire Orbs that travels around in the platform. These adds are prio one to kill because of the orb ability. If the orb is on the left side (Fel energy side) players that can soak the dmg should touch the orb. Phase 3 starts when boss is on 65% and thats when the Vandguard add dies. Xhul´horac starts drawing Void energy from the Void portal and summoning legion adds from the Void portal. Void Strike does very high damage on current target (tank). Withering Gaze does high damage on the one tanking him. This hit also increases shadow dmg by 20% for 9 sec and stacks. The debuff goes fast and the stacks go fast. Tanks can handle it. Black Hole is what this add literally does on a random location. This hole does high physical dmg to all players every sec. Players that gets sucked in gets DEADLY dmg (singularity) that is divided among players within 8 yards. When a Black hole appears, all ranged stack next to it and when players are stacked, move in to the black Hole as one. This add has one ability called Volatile Voidstep which makes him teleport to the nearest players location. The impact does moderate shadow dmg and spreads Creeping void if the explosion contacts any players. Teleports to the nearest players location, inflicting 78625 to 91375Shadow damage to any nearby players and spreading Creeping Void if it contacts any players. HOTFIX: Unstable Voidfiend's Volatile Voidstep no longer spreads Creeping Void if the explosion contacts any players on Normal and Raid Finder difficulty. Try move away fast if the add will teleport to you/near you. Adds will come from both portals as well. Selected Players will now move opposite than before to open up the area. Xhul’horac has now absorbed all the energy from the portals so they destroy and no more adds will come. The boss achieves one extra ability in this phase – Overwhelming Chaos. This ability also does moderate dmg to all players every 10s. Blood Lust/Time Warp and burn boss down.